In Mr. Dorman's room we learn something new everyday. For homework we have a paper with math problems that is called a TMR, we have to do at least 10 problems a day, and we also have some work from the math book to do as well. A TMR, is a piece of paper with 30 math problems that lasts us two weeks to finish. It is about everything that we have learned so far. TMR, stands for Tiger Math Review. This is our math lesson for this week. Iqualities are very easy to learn, but at the same time pretty difficult. An inequality compares two equations, using the symbols, <, >, < ,and >. An algebraic inequality is an inequality that contains a varible. Here are some keywords to help us remembr this symbol: < fewer than, or below. The symbol >, more than or above. The symbol <, means at most or no more than. The symbol > means, at least or no less than. These key phases help us remember which symbol would go with the word problem.For example: the capacity of a classroom is at most 60 people. The key phrase is at most, so I know I'll be needing the symbol <. I learned if I learn the word phrases, they will give me context clues on which symbol to use to solve the problem. It will also make it easier to understand and verify what the problem is.I had to write an inequality for each situation or statement in my math homework. I also learned to read what the question is asking and listen closely to what I am reading, so that I don't make simple careless mistakes. This can make a difference of awnsering the problem correctly or in correctly. I made the connection of what I learned in fifth grade, which was < , >, or = to. This was the next step up of learning these equations. I combinded the symbols >, <, and = to get these new and advanced symbols < and >. This makes sense to me now, and Im not sure if this would makes sense to me when I was in fifth grade. The tools I used to get better at this were: my math book, which allowed me to practice this new updated method though several problems, this gave me the oppertunity to fully understand what I was doing. I also used a big whiteboard to practice on, so that I can visualize the problem and focus on it. I transferd my problems on to my notebook, so I won't forget how to do these problems. This is what we are learning in Mr. Dorman's Pre-Algebra class. It is fairly simple. 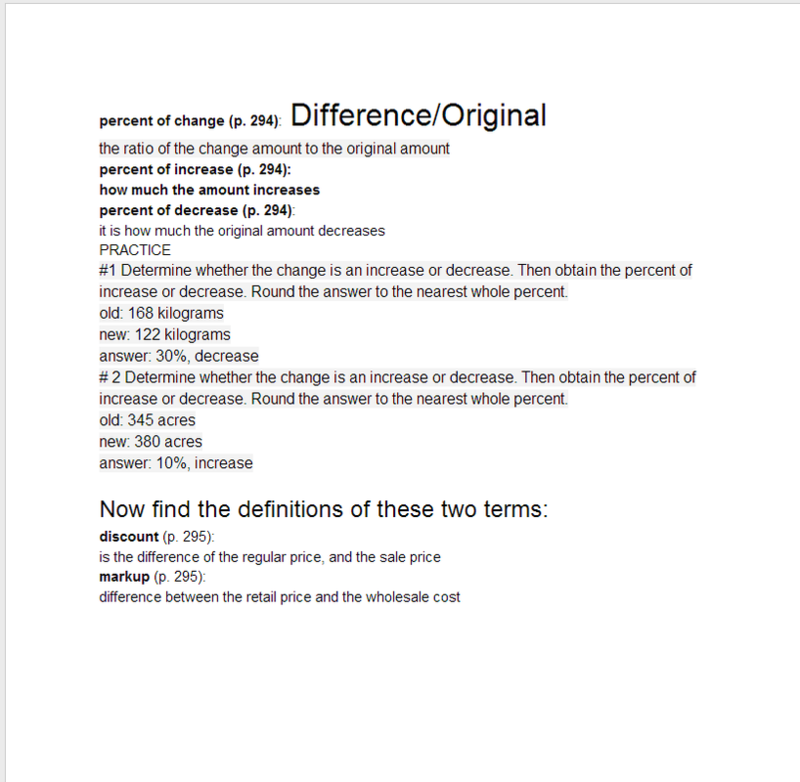 We wanted to learn the amount of increase or decrease in price. In other words, we wanted to see what percent that we saved from the total cost. This is a picture of the activity that we did to help us learn the material/. This paper gives practices on how to do this. We have to solve it the practice. Some of the work is just putting definitions in our own words. You can try the practice also as well.The tools that we used for this practice document was Google Drive. Google Drive allows the teacher to make a document then let other people edit it and make it their own. It is fairly simple. Do you know how to do this type of math? Maybe you have, but you forgotten. Click here, for a little re-teaching of this topic! 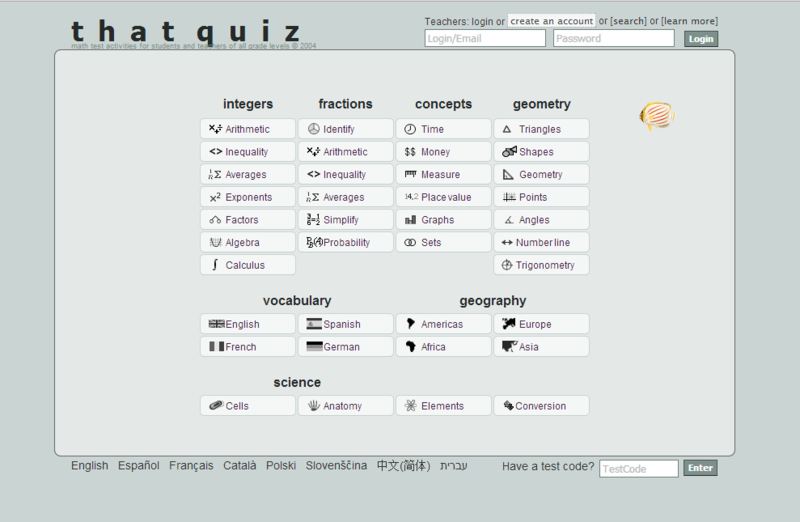 Have you ever heard of thatquiz.org thatquiz.org is a learning website for math and history The website allows teachers to make quizzes for their students. The teachers will then have access to their students scores. We use this most of the time for math. We mainly take quizzes for chapter tests in math or for practice. The tools that we use for taking tests and practicing, are of course this website. This website helps you learn the concept. It is very easy to navigate. A connection that I made with this was Quizlet.com Quizlet.com is a website that allows you to practice flashcards. Thatquiz is a great website to help you learn. Although some quizzes may be hard, this is only helping you memorize more.